The New York Knicks won their third away game of the year, against the Atlantic Division title holders and keep their road record positive (3-1), improving to 4-4 overall. Although both teams shot poorly from the field, a mere 42%, the advantage was made from the three point lane, with New York making almost half of their attempts (23) while the Raptors going just 4/17. The Knicks led for most of the game with the Raptors only being in lead for a short period on the second quarter but the most thrilling moments were those last 90 seconds of the game. New York was up 106-101 when Jonas Valauncias adds two points on a layup and narrows the gap at 3. 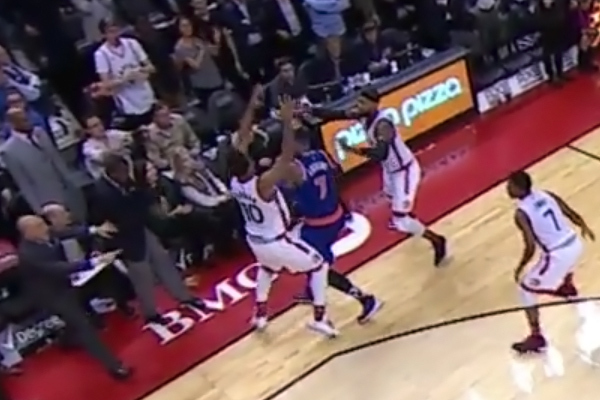 After James Johnson makes a couple of free throws, Carmelo Anthony steps out of bounds but the referees don’t call it allowing him to pass the ball to Lance Thomas who gets fouled immediately. The Raptors’ bench explodes in fury but the refs let this one go and Thomas makes both frees. After timeout the Raptors get the chance to tie the game but DeRozan misses two layups and a free throw. Lance Thomas rebounds, is fouled and doesn’t miss while Dwane Casey still argues with the official about the bad call on Anthony. Cory Johnson drops a three and it seemed like the Raptors were not done but 1.5 on the clock are not enough for Luis Scola to get the ball and take a clear shot. Carmelo Anthony led New York with 25 points, Lance Thomas had 17, flawless from long distance (3/3) and from the free throws (4/4) while Galloway added 15 points, 4 assists and 4 rebounds. Robin Lopez was also in double figures with 12 points and 8 boards.